Keto Zucchini Boats Stuffed With Bolognese & Cheese - DRIPPING with FLAVOR! Stuffed Zucchinis have been around for some time, they are certainly delicious enough to take a regular place on the menu. 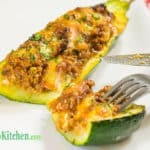 These Bolognese & Cheese Keto Zucchini Boats are very tasty and easy to make - a great mid-week meal! Slice the zucchinis in half longways and scoop out the seeds in the centre, making a canoe-like shape. Place the zucchini halves onto a lined roasting tray. Spoon the Low Carb Beef Bolognese Sauce into the zucchini canoes, evenly sharing the mixture between the 8 halves. Top the Bolognese with the shredded cheddar cheese. Bake the zucchini boats in the oven for 10-15 minutes, until the cheese is melted and golden brown.